We scored pumpkins for 99 cents at Aldi so we are living the come-back of the pumpkin. 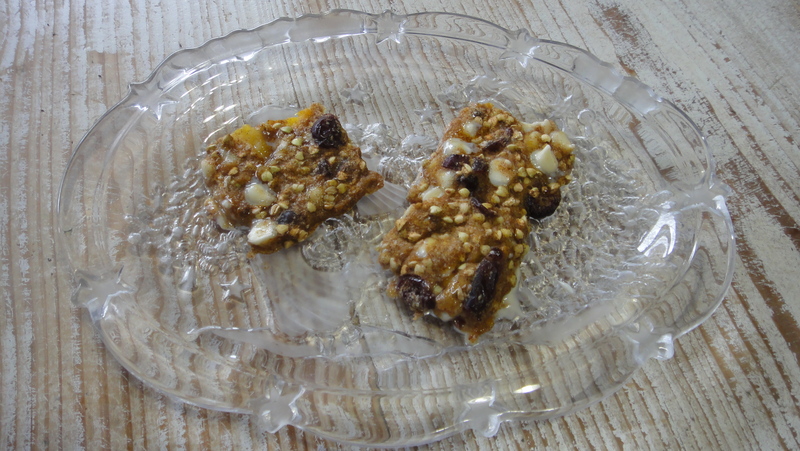 My son’s favorite recipe is pumpkin granola bars which are raw except for the cooked pumpkin. If you know of a way around that please post! If you do not have a dehydrator just cook them on low in the oven. 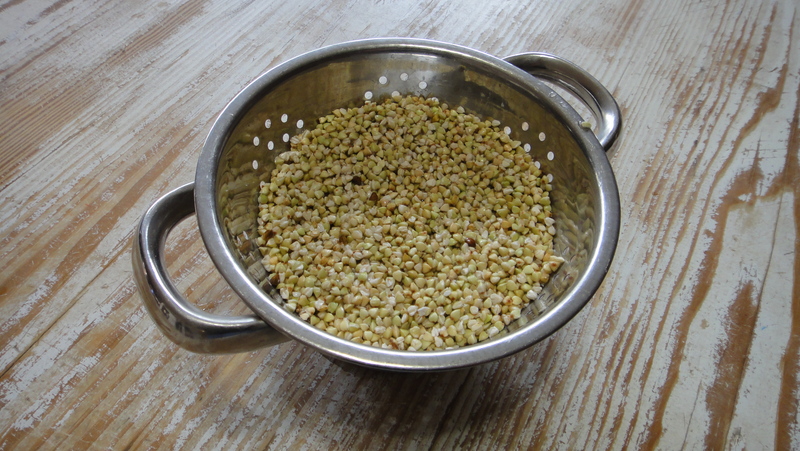 First we take a cup of buckwheat groats and soak them in water with apple cider vinegar to remove the phytic acid. Soak for at least 4 hours on the counter, longer is better. Drain the groats. 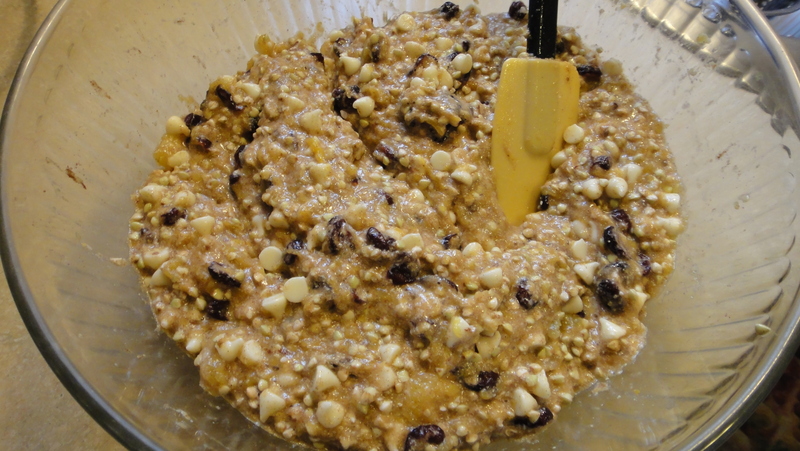 The base of the granola bars that hold the ingredients together is ground flax seed. 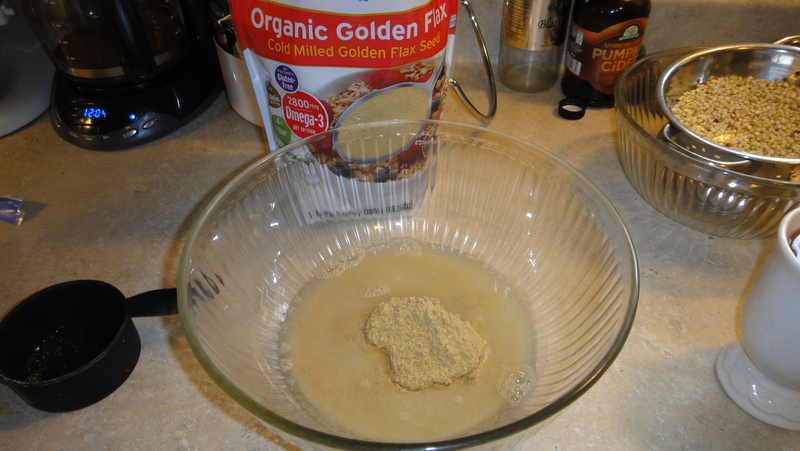 I use 1 cup filtered water to 3/4 cup ground flax and stir. This will turn into a gelatinous binder that holds all the ingredients in a bar. The flax is full of fiber so you can not use too much. Add more for a more solid or thicker bar. 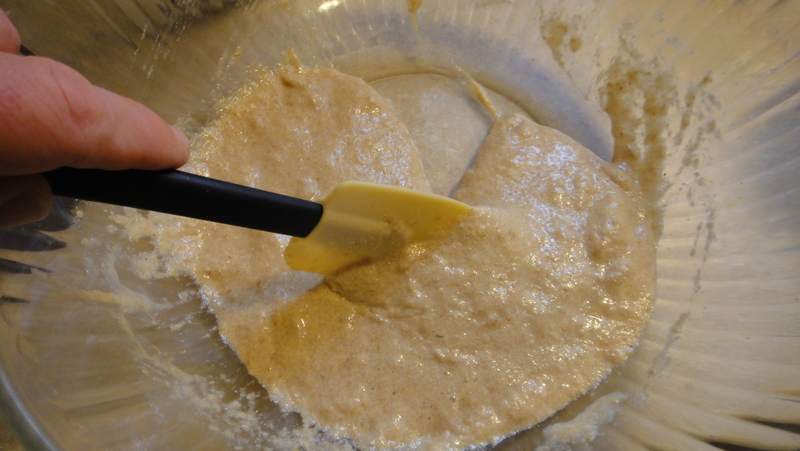 When you stir the flax and water together it will thicken as you let it sit. 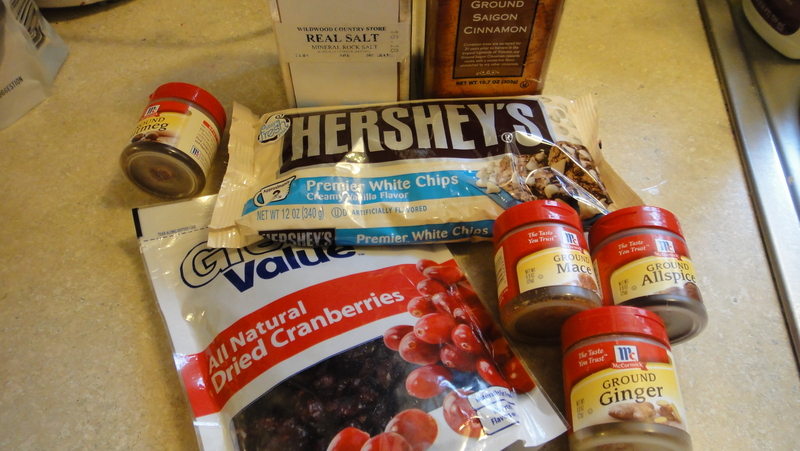 Add one bag of white chocolate chips, one small bag of dried cranberries. You can use any kind of berry or raisin we like cranberries the best during fall. Add all the pumpkin flavoring ingredients you like best. We use a couple teaspoons of cinnamon, a 1/2 tsp of salt, a dash of nutmeg, ginger, allspice and mace. 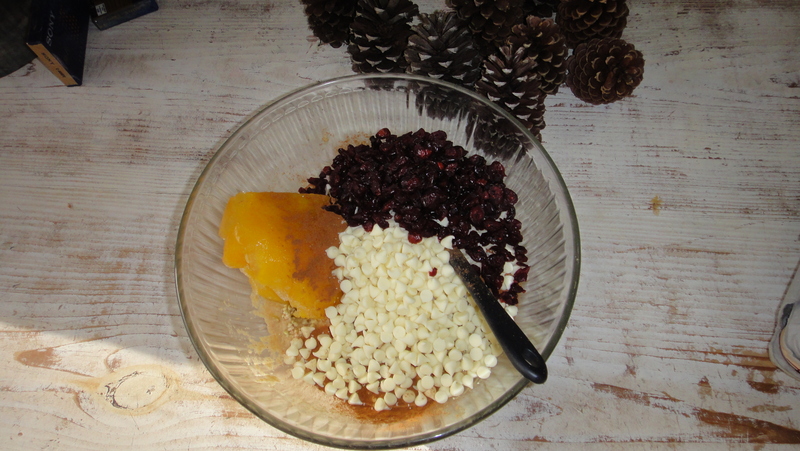 Add all ingredients to a bowl with 2 cups of pumpkin. Click here for the secret ingredient that will change your cooking! 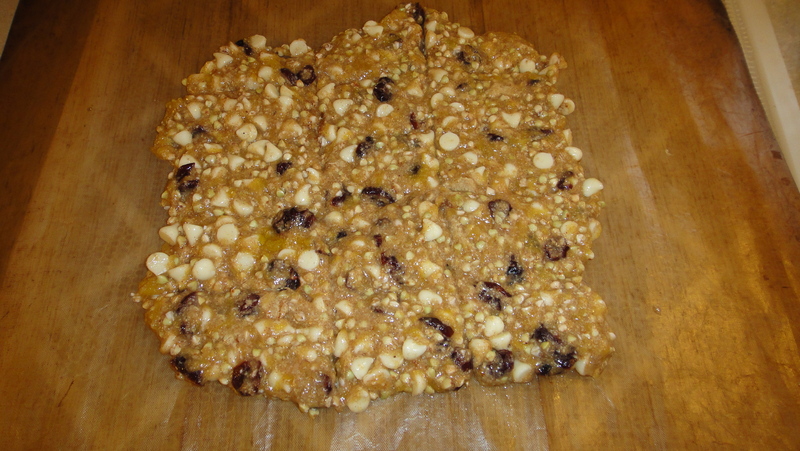 Spread out onto dehydrator sheets. Score with pizza cutter in the shape of bars so they are easier to separate one dried. 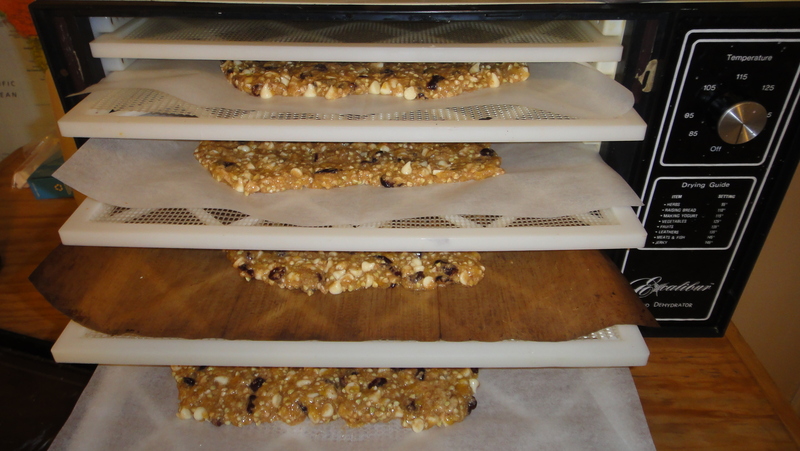 Dehydrate until firm: 125 degrees overnight up to a day depending on the thickness of your bars. 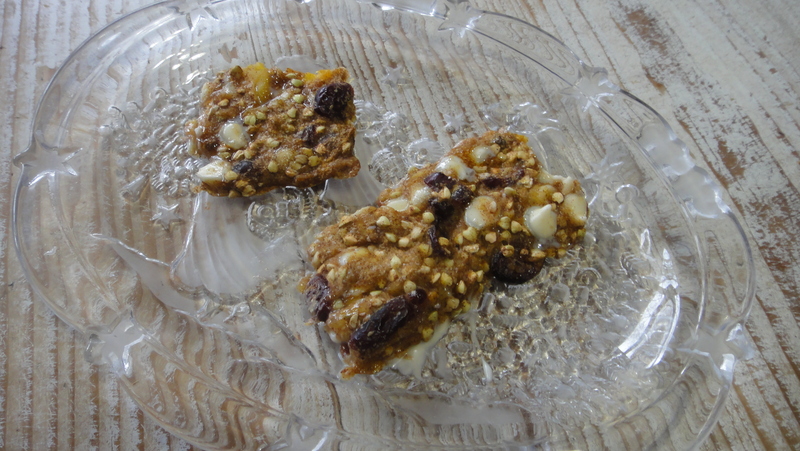 Thinner bars will dehydrate faster than thicker bars. Again, if you do not have a dehydrator you can cook them in an oven on low temp. The bars won’t be raw so you’re losing enzymes but you’re still benefiting from a very healthy snack! Store in snack sized Zip Lock bags. I was fortunate enough to sample this little piece of heaven while still warm. Talk about eye rolling, mouth watering, all kinds of yummy. Can’t wait to make this treat for my family over the holidays!